"As a general-purpose scripting environment I have found JSDB ... to be a superbly powerful and extensible environment for managing batch tasks."  A. M.
Download JSDB for Windows or Linux (x86), or Linux (x86, no ODBC), or Mac OS X (x86), or compile the source code. Click here, and follow along. Play around with a web user interface or grid programming. Read the Tutorial, study the Cookbook, or hack the source. Try the web-baseed remote debugger. Get involved! Read the release notes! Send me something cool you wrote! JSDB® uses the same language interpeter as FireFox (including E4X) to give you high-level control over powerful classes for databases, email, networking, and XML. Now, without ever firing up my compiler, I can write simple (and even complex) programs in 1/10th the time it used to take me with C++! I'm thrilled with JSDB, and I want to share it with you. It's open source, it's free to download, and it's unencumbered by IP claims. 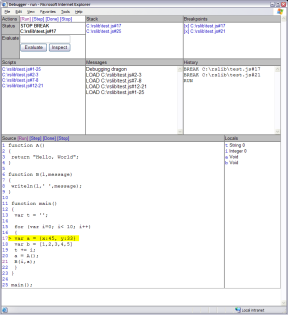 And I've just added a powerful graphical debugger to make it even easier to write network-centric programs with JSDB. I hope you like it! 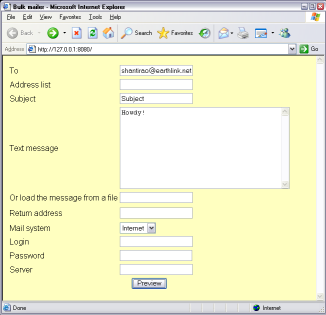 JSDB is based on Mozilla SpiderMonkey and class libraries developed by Raosoft, Inc. The open-source version is free with fairly generous license terms. Additional functionality or even less restrictive license terms may be purchased from Raosoft, Inc.
JSDB can treat any DBF/xBase, ASCII, Oracle, Sybase, DB/2, Postgres, MySql, Access, or Microsoft SQL Server table equivalently, translating high-level (set(row,field,value), get(row,field)) function calls to database-specific SQL commands. The same applies to email: you can communicate with Lotus Notes, Exchange (MAPI), and SMTP/POP3 mail systems interchangably with a single set of function calls. JSDB also includes a stream object that gives you a common interface to files, COM ports, sockets, HTTP, pipes, and memory. The ability to treat memory as if it were a file helps you write reusable code that is easily adapted to a variety of situations. It includes a simple and fault-tolerant XML parser library, and a specialized parser for EFS forms used by Raosoft's EZSurvey and InterForm programs. You can download JSDB and use it for free. You can give it to a friend, and she can use it for free, too. You can even sell JSDB, but check the license terms first. To show your gratitude, please contribute your own useful or thought-provoking creations to the public domain. JSDB is based on the public-spirited contributions of many people who believe in sharing. JSDB is a registered trademark of Shanti Rao. Raosoft is a registered trademark of Raosoft, Inc. The name JSDB may only be used to describe the software downloaded from this web site. Any alterations, including embedding in other programs, may not be called JSDB without the prior written permission of Raosoft, Inc.
JSDB has no warranty, express or implied. Don't use it for medical devices or avionics. JSDB is subject to certain license terms which apply if you redistribute it in whole or part (including derived works). Contact us to purchase a CD with less restrictive license (for bundling with a closed-source product, for instance) from Raosoft, Inc. Prices are reasonable, starting at $50. Please see the license for warranty and limited liability statements. Click here to download JSDB and start exploring today!